This dessert is a classic in France, and typical of the “king cakes” produced in many cultures at Epiphany, the “twelfth night” of the Christmas season which celebrated the coming of the Magi. In New Orleans, where it is called “King Cake”, it is enjoyed right through until Mardi Gras. The idea is that you share this with friends and family as part of the celebrations. 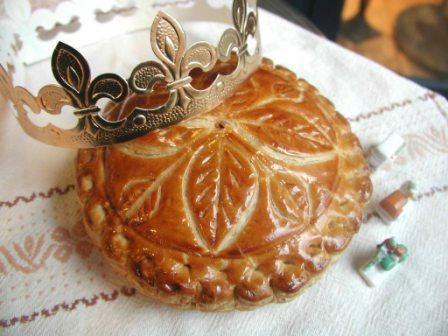 Tradition says you bake a bean in the filling, and the person who gets the bean in their piece of torte is then the king or queen for the evening. The torte is made with puff pastry (purchased pastry will work fine), pastry cream and almond paste. You can prepare the filling ahead of time if you wish. Rinse a medium saucepan with cold water (to help prevent scalding the milk), then pour in the milk and vanilla. Bring the milk just to boiling (do not let it boil), then remove pan from heat. In a small bowl, beat together the flour, sugar and egg, till a pale mixture forms. Add the heated milk gradually, stirring. Pour this mixture back into the saucepan and cook over medium heat, stirring constantly, till mixture thickens. Once thick, remove from heat and let cool, stirring occasionally to prevent a skin from forming. Cover with plastic wrap and refrigerate. Beat butter till smooth in a large bowl. Add the sugar, almonds and cornstarch, and mix well. Add the beaten egg, then gradually add the cooled pastry cream. Lastly, stir in the rum. Mix well to obtain a smooth consistency. Preheat the oven to 220C (450F). Slightly dampen a large cookie sheet with a clean wet cloth. Roll out two circles 22 cm (9 inches) in diameter – one with each half of the puff pastry. Put one of the circles on he cookie sheet. Brush the outside edge of the circle with some of the beaten egg (about 1 cm/half an inch wide). Then, being extremely careful to not go over the egg border, spread the filling in the circle. If you do go over the egg with the filling, wipe the filling away and re-brush the area with egg so the pastry “roof” will stick on the torte. If you are using a bean, insert it now into the filling, not too close to the centre. Cover the filled circle with the second circle of pastry. Working at a slight angle to the edge of the circles, pinch the edges together with your thumb and forefinger (like you do for a pie crust). Once the torte is sealed, refrigerate for one hour. Bake for 10 minutes at 220C (450F), then reduce temperature to 200C (400F) and bake for another 20 minutes or until top is golden brown. Let cool for a few minutes before cutting. Can also be served at room temperature.